I am very pleased to announce that Leela Cyd & I are hosting the very first Santa Barbara Pie Contest! Please enter your favorite sweet OR savory pie; or just come taste (& silently judge) the selections, sip holiday cocktails, & get your portrait taken by the one & only Lindsey Ross! Registration ends on 12/18 - so hurry and enter your pie (only $15) and get all the details. I can't wait to see what beautiful & delicious creations you all make! In some ways Jesse and I both had very unusual childhoods (homeschooled, and all that jazz), but as time goes on I continue to learn how traditional I really am. Which is why I absolutely loved all of the traditions and rituals that went along with getting engaged and married, many of which I had never thought about as applied to myself before. For example, a few days before he proposed (after picking out a stunning vintage ring entirely on his own), Jesse went to my parents' house to ask them for their blessing. He brought my mom flowers, and told them that I am the love of his life. I can't even begin to describe how I feel thinking about that happening. To have all of the most important people in my life all rooting for us together is the warmest feeling I have ever known; a gift he gave me with the ring. Jesse's proposal was a complete surprise - he took me out to our favorite sushi spot, and then casually brought me up to the roof at Brooks, a beautiful old building in Santa Barbara, where I walked out to find a candle lit walkway, an alter full of candles and flowers, and a 40-foot slideshow of home movies and photos of our three years together playing across the street (city sanctioned). He told me all kinds of wonderful things - that he wanted to spend the rest of his life with me - and then got down on one knee, pulled out a ring, and asked me to marry him. It was amazing. After celebrating for a while just the two of us on the roof ("let's go to Vegas and get married right now!") we made our way to our favorite dive bar - champagne bottle in one hand, flowers in the other - where I was surprised (again) to find our family and friends waiting to celebrate with us! It was the happiest night of my life. Getting to this moment was the work of our village; so many loved ones contributed little (& big!) pieces of magic to make our wedding the most incredible celebration of love we could ever have imagined. During the planning period, Jesse and I had weekly meetings with my family (yes, WEEKLY) to talk logistics & details (and taste cake & champagne). Without them we never would have had the wedding we did, and we owe each of them several lifetimes worth of gratitude. Here are some of my favorite moments & details from the wedding we crafted together, as a family, around our kitchen tables. With no time for a save-the-date (we started planning with only three months till the big day!) it was important to Jesse and I to create an invitation that spoke to the kind of celebration we wanted: sincere, celebratory, and full of love. This is where the name for our wedding, Ojai Fidelity, came from (Jesse's punnery). 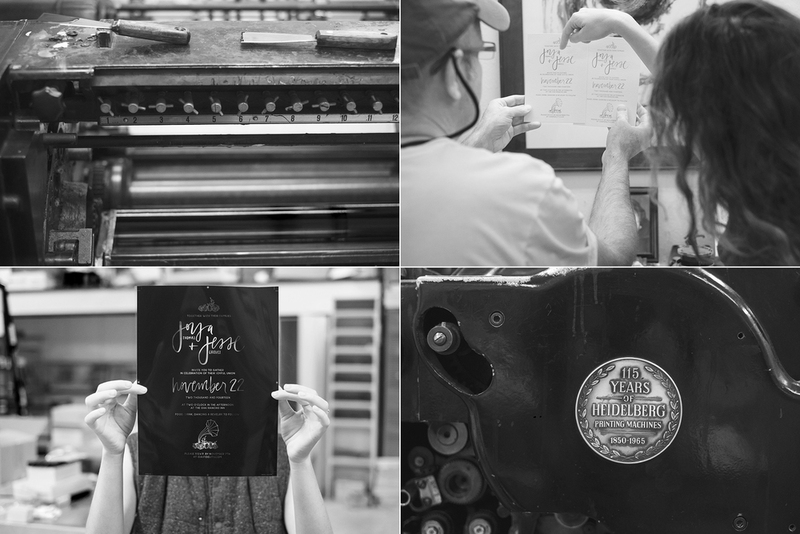 We designed the invitations together, I illustrated them, and then we worked with master craftsman Norman of Classic Letterpress in Ojai to letterpress them onto soft cotton paper. We're so happy with how they turned out - but it's true what they say: it's hardest to design for yourself! We had the incredible experience of harvesting lavender for our wedding on a family friend's farm in Santa Ynez. It was a stunning property, a gorgeous day, and a completely blissful experience collecting natural materials for our wedding in the glowing light with my family. Look at this place! The lavender was then dried and hulled over the next couple of months by my very wonderful & patient father, and then packaged up by me and my girlfriends at my bachelorette party (completely epic weekend at Bar SZ Ranch planned by Jordan - the best Maid of Honor in the world). Our guests all received a little packet as they entered the ceremony site, and then tossed the contents as Jesse and I left the ceremony to Edith Piaf. 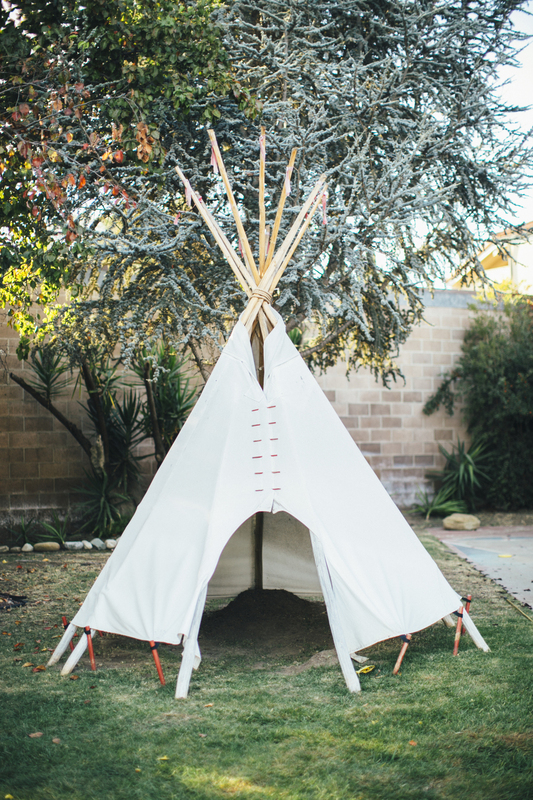 Since so many of our guests were staying on site at The Rancho, we asked all of our friends to pitch in for almost all of the day-of things: building the wedding arches (2), setting up tables, chairs, and other furniture, arranging greenery (everywhere), and so, SO much more. While for brief moments I had pangs of worry that we were asking too much of our loved ones and that they'd rather lounge by the pool (probably more than a little bit true for some), mostly I was overwhelmed by the amazing experience of being GIVEN a wedding by those I love. To walk down the aisle they had created, and say my vows under the arch they had built, was so rewarding, and I hope it was the same for them. Our friend Jane Hankey made my beautiful pearl headpiece by hand - didn't she do an incredible job? My bridesmaids and I spent the morning of the wedding out on the sunny pool deck making our bouquets and the boutonnieres for the groomsmen before getting ready. It was such a wonderful, relaxed moment; a perfect opportunity to tell the women in my life how much they mean to me, and give them a pair of garden shears; a gift inspired by my mom, who gave the same gift to Jordan and I some years ago and believes firmly that every woman should own a pair of garden shears and have a chilled bottle of champagne ready at all times. I loved that it was just us getting ready; no makeup artists or hair stylists, just us (and plenty of champagne)! Jesse and I followed tradition in that we didn't see each other between parting ways at the end of the rehearsal dinner and my walk down the aisle. This was particularly difficult due to the fact that the entire wedding party was all staying on the same small property for the whole weekend. But we pulled it off, and I loved that I could hear him swim in the pool that morning with his friends while I got ready, knowing we would be married in just a few hours. We also sent each other wedding-day letters, his accompanied by a beautiful locket with a photo of us inside. Jesse also had a relaxing time with his friends preparing for the ceremony - some more relaxed than others. They toasted with whiskey, and Jesse gave his groomsmen each a bone pocket knife in the vein of the one he carries with him always, which belonged to his great-grandfather, given to him by his father. Didn't they do a beautiful job on their bouquets? I especially love the use of vines we collected from the hills between Santa Barbara & Ojai. Our impossibly sweet ring bearer and flower girl were Jesse's (and now mine!) nephew and niece. When I later asked Jack what his favorite part of being ring bearer was (a role he took very seriously, as you can see here), he said "the green leafs" referring to the vine on his tray. My favorite part was his irresistible newsy outfit! P.S. He carried the real rings, and Madeleine tossed lavender from our harvest. This is an iPhone photo taken by our friend and day-of coordinator, Percy Sales, but it is such a wonderful moment between my dad and I, it had to be a part of the day's story. My dad is the kindest, most generous man I know, and it meant everything to me to have his abundant love and support as he gave me away to Jesse. I walked down the aisle to musician/groomsman Gabe Strycharz singing & playing a version of Ryan Adams' "Desire". For both of us, saying the vows we wrote to the other, and receiving theirs, was a completely transcendent experience. We could never have anticipated the calm we would feel, or the way our focus and love would wrap us up and block out everything else so we could fully mean what we said, and fully hear the gifts that were our partner’s words. It was an incredible moment, and one we will never forget. We also had each of our sets of parents - both married for over 30 years - say a blessing for us during the ceremony, which was very special to us. Our celebrant, Nanette McIntyre, was an invaluable resource in helping create a ceremony true to us. I truly can't imagine a more perfect way to commit myself to my husband. After the ceremony (and a moment alone to realize that WE'RE MARRIED!!) Jesse and I gathered in the bridal suite with our immediate families to read & sign the ketubah. This is a practice we took from jewish tradition in which a marriage contract is drawn up in a decorative way, signed by family members or friends, and then hung in the couple's home as a reminder of their commitment to one another. In our case, we wrote the contract ourselves, and artist/groomsman Todd Roeth designed it for us. We had both our parents and siblings sign it with us. I loved the process of deciding what we wanted to promise to in our contract, and then sharing that in an intimate setting with just our families. For cocktail hour Jesse made a bourbon cocktail, Hi-Fi Cider, there was a stunning cheese & charcuterie spread designed by sister-friends Jordan, Bella, Emilia, and Luisa, guests took polaroids of each other for the guest book, and vinyl spun on the record player. Dinner was served at one big table outside with four arms, which we loved because it made everyone feel close & connected, like at a dinner party. Plus, Ojai is the prettiest backdrop. The stunning (!!) maple bourbon pecan wedding cake was made from scratch by my mom and sister, the latter of whom just FINALLY made her wedding cake business official with Pie for Breakfast! I may be biased on more than one count, but it was the best cake I've ever had. The beautiful wooden stand was hand made by multi-talented groomsman Gabe Strycharz, and wood-burned into the handle by bridesmaid Mikaila Allison with our initials and the day's date. We gave matching boards to each of our sets of parents on the day as mementos. My sister Jordan and Jesse's brother Dan, maid of honor and best man, both gave heart-felt, funny, sweet, nostalgic, and positively spectacular speeches. Not a dry eye in the house. These are the most influential people in our lives after our parents - and we wouldn't be the people we are now without them. Lucky doesn't even begin to describe it! My dress is by wonderful human and brilliant designer Shareen. She has an UNREAL warehouse in downtown LA (as well as a retail location in New York) and my mom and sister and I had the most wonderful experiences spending time with her during fittings while I tried on every single one of her perfect collection of timeless, ethereal silk gowns. What an incredible weekend - an incredible six months - and a bright, bright future! We are filled to the brim with gratitude for it all.